Increasing productivity by helping employees achieve financial stability. Consolidated Credit helps not just individuals but businesses, too. Our Financial Wellness Program offers online tools such as interactive courses, calculators, and videos. We work with hundreds of companies, organizations, municipalities, and charities of all sizes. But they have one thing in common: A desire to help their employees/members become financially healthy. Of course, a healthy employee is a productive one, and that applies to financial health as well as physical health. By providing resources to employees that help them achieve and maintain financial stability, an employer can reduce distractions in the office and time taken out of work to handle personal issues. Employees can focus on work instead of worrying about their finances at home. KOFE is our financial wellness program – it’s a corporate financial wellness program – and it stands for Knowledge of Financial Education. 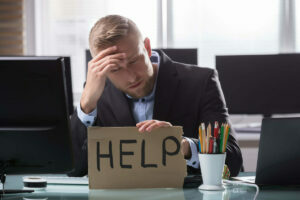 Employers are noticing that nowadays employees are not only finding themselves with health issues, but also having a lot of problems with their personal finances. And they’re also finding that personal finances are affecting the bottom line of the company. So employers are reaching out to Consolidated Credit more and more, looking for that corporate financial wellness program that it can add to that mix of offerings they have in their wellness initiatives. Typically we see change in things like turnover rates, production goes up, time from work to go take care of financial situations. It automatically makes happier, healthier and more productive employees. KOFE is a financial wellness program that has different features. The online features is a portal we give to the corporation to put on their internet. Employees will have access to a lot of different tools, also a dedicated toll-free line so the employees will have access throughout the year to unlimited and free financial coaching. Overall we see that companies are a lot more productive and employees are happier and more loyal to the company because they’re offering a lot more wellness initiatives, like our financial wellness program. KOFE, short for Knowledge of Financial Education, is a leading online financial literacy platform that educates individuals about the language of money. Our cloud-based, independent and unbiased financial education and engagement platform, assesses and benchmarks participants overall financial fitness, and then presents them with user-friendly tools to help them engage and learn how to live within means and reach their financial goals. KOFE has three important components. First the online platform, then we combine it with one-on-one financial coaching delivered by certified credit and housing counselors, and lastly, we present them with live and recorded webinars, which can also be presented face to face. BenefitsPro, the # 1 online destination for benefits professionals, recently featured Consolidated Credit’s financial wellness program KOFE (Knowledge of Financial Education) as one of five top value-add technologies in the benefits market after it launched in 2016. Employee benefits brokers have an increasing number of innovative “value-add” solutions they can offer their employer group clients. In some cases, brokers can receive commissions from these solution providers for referring clients to them. But in all cases, the value-add services can generate greater appreciation from their clients, resulting in stickier relationships. BenefitsPro recognizes KOFE as an innovative value-add benefits program that uses a combination of technology and financial coaching to improve the financial lives of an organization’s employees. How does KOFE help employers? Consolidated Credit helps employees deal with life-altering credit, debt, and financial issues. The KOFE financial wellness program provides free financial education resources to educate employees on the skills necessary to live a financially secure lifestyle. Budget calculators, worksheets, infographics, interactive courses, and videos teach employees to live within their means and stay financially fit. By using these tools, employees are encouraged to save and invest while they reduce expenses and debt. The app offers guidance on establishing achievable financial goals, building a personal budget, managing financial stress and planning for the future. What’s most unique about the Knowledge of Financial Education (KOFE) portal is that it’s not a static package, says Gary S. Herman, president of Consolidated Credit in Fort Lauderdale, Florida. It includes online resources such as videos, webinars and interactive courses, but nonprofit also offers the ability to have financial coaches go out to locations or help them over the phone. The nonprofit starts by consulting with employer groups to find out what they are looking for, including whether or not they want the personal finance education to be co-branded. After the initial consultation, Consolidated Credit builds the program based on wht specific component the employer wants to offer their employees. Some employers just want to require employees to complete a session with a financial coach before receiving any pay advances or loans from qualified plans such as 401(k) plans,” Herman says.” It’s a good idea to have employees go through a confidential budgeting session so that they can figure out how to pay themselves back, which many times they can’t. Some employers want a program to get their employees to understand the importance of savings and the secrets to building and maintaining good credit. What other benefits does KOFE provide? The app also includes financial advice on how to understand credit scores and how to rebuild credit; organize and categorize savings, and how to cut costs on energy, health care, insurance and other household bills; student loan consolidation and using credit on campus; planning for live events such as weddings, births and unforeseen disasters; information on 401(k) plans and individual retirement accounts and debt elimination versus retirement savings. The advantage of working through the nonprofit is that its community counseling programs have been paid for by financial services companies such as JPMorgan Chase & Co., Citigroup Inc. and Bank of America Corp.
Due to the funding, the cost of the program is very affordable to employers, he says. Want more information about our Financial Wellness Program? How much are financial issues costing your company? And we don’t mean your corporate finances. We mean the financial issues and challenges faced by your employees. Research indicates employees with financial difficulties use 20 hours of work per month, on average, to deal with their problems at home. That loss in productivity can have a significant impact on your business. Late projects, missed deadlines, low-quality work, and distracted employees can really add up to negatively affect your bottom line. Financially healthy, happy employees are profitable employees. With that in mind, the financial well-being of your employees needs to be a top priority for you. You may have heard of financial literacy programs in the past, but KOFE is unique. We start with a state-of-the-art online platform that can be accessed by your employees anywhere in the world. The easy-to-navigate portal makes building a better financial outlook engaging and exciting, so your employees are more likely to use it consistently and take action. KOFE is also highly personalized. Your employees have free access to talk directly with our staff of certified credit counselors. Any questions, issues, or special needs can be addressed quickly and effectively, so your employee won’t be distracted on the job. So, take the next step in providing a comprehensive benefits package to your employees, including vital financial education and support. Contact us today to speak with a KOFE program specialist and schedule a free demonstration. Simply email us at [email protected], and a community outreach team member will reply quickly. Or call us at 1-800-901-8304.